(Phys.org)—In the tribal societies of the Amazon forest, violent conflict accounted for 30 percent of all deaths before contact with Europeans, according to a recent study by University of Missouri anthropologist Robert Walker. Understanding the reasons behind those altercations in the Amazon sheds light on the instinctual motivations that continue to drive human groups to violence, as well as the ways culture influences the intensity and frequency of violence. "The same reasons - revenge, honor, territory and jealousy over women - that fueled deadly conflicts in the Amazon continue to drive violence in today's world," said Walker, lead author and assistant professor of anthropology in MU's College of Arts and Science. "Humans' evolutionary history of violent conflict among rival groups goes back to our primate ancestors. It takes a great deal of social training and institutional control to resist our instincts and solve disputes with words instead of weapons. Fortunately, people have developed ways to channel those instincts away from actual deadly conflict. For example, sports and video games often involve the same impulses to defeat a rival group." Walker examined records of 1,145 violent deaths in 44 societies in the Amazon River basin of South America by reviewing 11 previous anthropological studies. He analyzed the deaths on a case-by-case basis to determine what cultural factors influenced the body counts. Internal raids among tribes with similar languages and cultures were found to be more frequent, but with fewer fatalities, when compared to the less frequent, but deadlier, external raids on tribes of different language groups. "Language and other cultural differences play a role in the 'clash of civilizations' that resulted in recent violence, such as the deadly attack on the U.S. embassy in Libya and the continuing war in Afghanistan," said Walker. "Working to develop a shared sense of humanity for all the Earth's people could help reduce major episodes of violence by encouraging people to view each other as one unified group working towards common global goals." Raids also sometimes involved kidnapping women. A similar number of women were kidnapped on average in both internal and external raids. Another aspect of Amazonian warfare was treachery, such as inviting a rival group to a feast and then slaughtering them after they got drunk. These attacks resulted in high levels of mortality. "Revenge was necessary in historical intertribal warfare, just as in modern gang conflicts, because showing weakness would result in further attacks," Walker said. "That cycle of revenge could result in tribes eradicating each other. 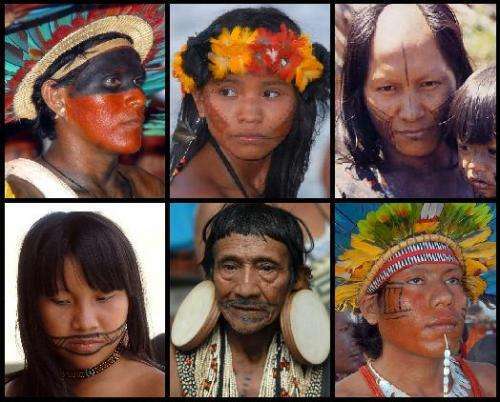 After European contact, the dynamics of Amazonian tribal life changed dramatically. Although the spread of Christianity and imposition of national legal structures resulted in a great loss of cultural identity, it also reduced deadly raids. Today, such violence is rare. Disease and conflict with illegal loggers and miners have become the more common causes of death." More information: The study "Body counts in lowland South American violence," was published in the journal Evolution & Human Behavior.